O/o Chief Judicial Magistrate, Jorhat. 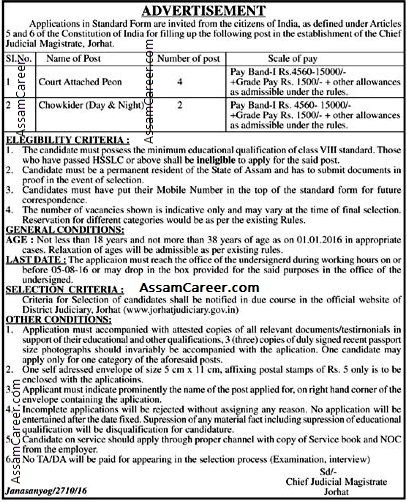 Applications in Standard Form are invited from the citizens of India for filling up of the following posts in the establishment of the Chief Judicial Magistrate, Jorhat. Candidates must possess minimum educational qualification of Class VIII standard. Those who have passed 10+2 or above shall be ineligible to apply. Candidate must be a permanent resident of Assam. Candidate's age must be 18 to 38 years as on 01-01-2016. How to apply: Pl check the Advertisement Details for more details.